On Friday, March 27, from 9am the Dilmun Stables in Saar will host one of the showjumping events of the season and the show is open to all stables and will include three challenging classes. * Treasure Hunt for Juniors - With a mixture of cross poles and jumps up to 80cm in height, riders have 60 seconds to jump whichever obstacles they choose. The scores for each jump are unknown to riders and judges until the secret envelope is opened at the end and points are tallied. * Adult Speed Class – A thrilling event testing the prowess of both rider and mount. * Junior and Adult mixed accumulator with joker – Scores are added or subtracted for each jump as the rider goes round and the final jump has two choices with the Joker attracting higher points. Riders must make a quick decision at the end as to which jump they need to go over. * Dilmun Stables Open Dressage Show on Friday, starting at 9am. There will be three British Dressage tests – Introductory A, Preliminary 7 and Novice 27, overseen by international judges. Entries must be submitted today. Call 17693766 for more details. 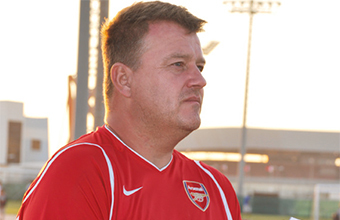 * Dressage trainer Oliver Walter is in Bahrain and conducting lessons until Saturday. Contact Jerri Taylor on 33309972 or email jerritaylor72@yahoo.com for more details. * Horse racing is being held at Sheikh Rashid Equestrian and Horse Racing Club every Friday starting at 2pm. Entrance is free, and there is entertainment and attractions for all the family to enjoy. 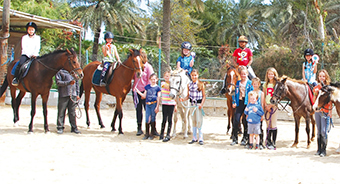 Twin Palms Riding Centre held an in-house Gymkhana and Cowboy Show on Friday attracting riders young and old. It all started with 15 clamouring youngsters in a Potato and Spoon Race won by Savanna Colkitt riding Yatzy, followed by a Sack Race, held over three heats, and the overall winner was Jilana Abduljawad with Earl. Next came the Get the Balls in the Bucket challenge which was not as easy as it sounds as ponies don’t always do as they are told. Sabrina Al Damouk and Earl were triumphant in the task. The Cowboy Games were held in two sections. The intriguing Three Leaf Clover Barrel Race featured riders bending their mounts round barrels and galloping to the finish. Section one of this fast and furious affair was taken by Kiana Haseid with Nafa and in section two Aimee Keen and Rio skidded into first place. Up next was barrel racing with riders taking their horses and ponies up one line of barrels and back down a line of cones with extreme speed. Taking first place in section one was Savanna Cruickshank and Lime, while Pippa Fourie deftly floored the nifty Soda to win section two. The final Western Working Equitation required speed and dexterity and involved galloping up the barrels, halting, a barrel slalom, halting once more and zigzagging around a maze of poles before turning in full gallop to the finish. This was not a game for the faint-hearted and a definite crowd-pleaser. Section one saw the talents of Chipmunk shine through with Molly Wharton to claim top spot. In section two, Elaine Galbraith, riding Steve, executed a penalty-free round in the fastest time to win. On Saturday BREEF held its eighth Show Jumping Championship with two junior classes, followed by three adult classes plus the Grand Prix. The event was sponsored by GPIC. Nedhal A Nabi astride Lucito Fool took the juniors first prize with Aimee Keen astride Rio runner-up. In Junior Two, the winner was Ahmed Essa astride Osina, with runner-up Mayoof Al Rumaihi riding Mashallah. In the first adult class, Muslim Ali on Emily triumphed over 18 riders, including stable colleague Bassim Mahdi riding Estrella in the jump-off. In the second adult class over a two-phase course, veteran Sami Ghazwan with Fairooz stole the show, while Basel Al Dossari came second on Dilmun Dory. Once again Ali and Salman Faraj, the only two riders to have clear rounds in the first round, took the Grand Prix to a nail-biting jump-off. Although both had a pole down it was Faraj who was just that bit faster to claim the title. The next BREEF Show Jumping Event is on March 21. Potato and Spoon Race: 1 Savanna Colkitt/ Yatzy, 2 Sabrina Al Damouk/ Earl, 3 Yasmine Khonji/ Smudge, 4 Jilana/ Lord, 5 Emaline/ Eid, 6 Isabella/ Pearl. Sack Race: 1 Jilana Abduljawad/ Earl, 2 Savanna Colkitt/ Yatzy, 3 Yasmine Khonji/ Smudge. Balls in the Bucket: 1 Sabrina Al Damouk/ Earl, 2 Savanna Colkitt/ Yatzy, 3 Kit Meakin/ Toyboy, 4 Oliver Conway/ Red, 5 Tara Khonji/ Master, 6 Tegan Cruickshank/ Lime. 3 Leaf Clover Barrel Race – Section One: 1 Kiana Haseid/ Nafa, 2 Savannah Cruickshank/ Lime, 3 Grace Haliday/ Abba, 4 Daisy Dennison/ Master, 5 Savanna/ Yatzy, 6 Molly Wharton/ Chipmunk. Section Two: 1 Aimee Keen/ Rio, 2 Elaine Galbraith/ Steve, 3 Bella Rushton/ Smudge, 4 Jameela Haseid/ Nafa, 5 Pippa Fourie/ Soda, 6 Gina Fourie/ Ayax. Barrel Bending Race – Section One: 1 Savannah Cruickshank/ Lime, 2 Immy Rushton/ Abba, 3 Molly Wharton/ Chipmunk, 4 Daisy Dennison/ Master, 5 Savanna Colkitt/ Yatzy, 6 Kiana Haseid/ Nafa. Section Two: 1 Pippa Fourie/ Soda, 2 Elaine Galbraith/ Steve, 3 Helen Blake/ Loki, 4 Gina Fourie/ Ayax, 5 Hussain Jamali/ Mandella, 6 Jamiela Haseid/ Nafa. Western Working Equitation – Section One: 1 Molly Wharton/ Chipmunk, 2 Immy Rushton/ Abba, 3 Grace Haliday/ Abba, 4 Savannah Cruikshank/ Lime, 5 Savanna/ Yatzy, 6 Kiana Haseid/ Nafa. Section Two: 1 Elaine Galbraith/ Steve, 2 Gina Fourie/ Ayax, 3 Maryam Al Khalifa/ The Chief, 4 Imogen Nell/ Mohito, 5 Aimee Keen/ Rio, 6 Kat Rushton/ Sirocco. Junior One - One round with jump-off: 1 Nedhal A Nabi/ Lucito Fool, 2 Aimee Keen/ Rio, 3 Abdulla Ali/ Ghoroob, 4 Ahmed Al Hashili/ Wapiti, 5 Coco D’zouza/ Dilmun Tayar, 6 Mayoof Al Rumaihi/ Granus. Junior Two – Two-phase: 1 Ahmed Essa/ Osina, 2 Mayoof Al Rumaihi/ Mashallah, 3 Aimee Keen/ DJ Fleur, 4 Nedhal A Nabi/ Horse Pride Thunderbolt, 5 Ahmed Essa/ Lucy, 6 Charlotte Gunby/ Dilmun Boeing. Adult One – One round with jump-off: 1 Muslim Ali/ Emily, 2 Bassim Mahdi/ Estrella, 3 Abbas Yousif/ Argentini, 4 Jane Bowden-Clark/ Dilmun Tayar, 5 Yahya Ahmed/ Loly Pop, 6 Saber Salman Faraj/ BDF Bahrain. 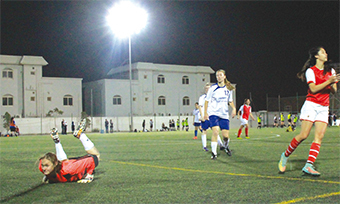 Adult Two – Two-phase: 1 Sami Ghazwan/ Fairooz, 2 Basel Al Dossari/ Dilmun Dory, 3 Ahmed Mansoor/ Edward Du Sud, 4 Jassim Essa/ U U P, 5 Saber Salman Faraj/ BDF Bahrain, 6 Ahmed Mansoor/ BDF Mansoor. Adult Three – One round with jump-off Grand Prix: 1 Salman Faraj/ My Precious, 2 Muslim Ali/ Pascal, 3 Sami Ghazwan/ Fairooz, 4 Jassim Essa/ U U P, 5 Eyad Ahmed/ Barelo, 6 Ahmed Mansoor/ Edward Du Sud.